We know him from all over the internet. He has thousands of videos, articles, fans as well as some great Fitness Programs. His name is Vince delMonte, also known as “The Skinny Guy Savior”. You can find many interviews out there asking him the basic questions related to his programs and his own body transformation, so for today we’ll ask him something totally different! 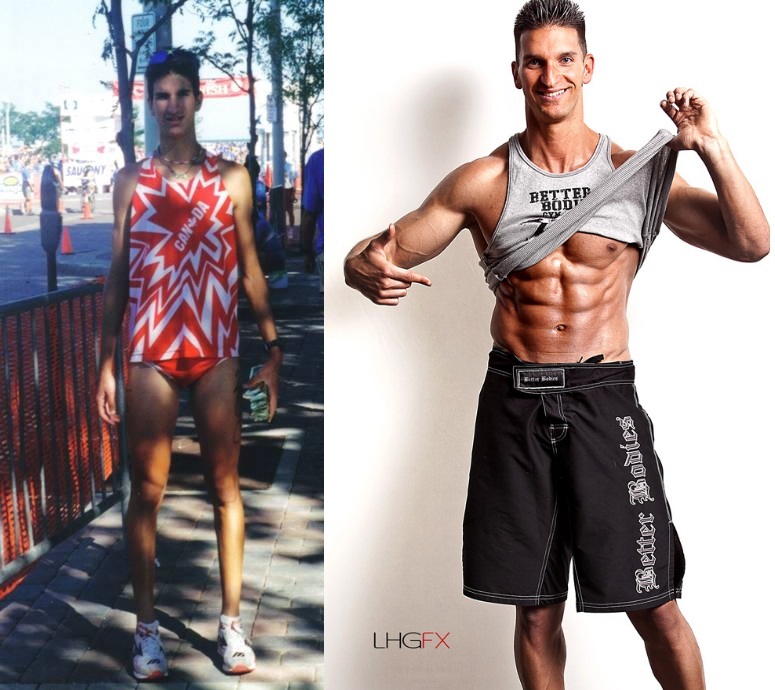 I probably have the most popular and publicized "skinny to muscular" transformation stories in the world. A real “hard-gainer” – although I don’t really believe in that term anymore. “Hard gainers” often just are uneducated on what it takes to build a muscular physique. Anyway, I was clearly the poster boy for all of the guys out there that can’t seem to gain weight and can’t get the girl. I am sure you all know my nickname being “Skinny Vinny” in my younger days, and I am pretty sure it had something to do with the fact I weighed somewhere between 140 and 150 soaking wet! This nickname stuck with me through college. Let me be the first to tell you, when you go from 150 to 190 pounds…EVERYTHING in your life changes. People starting looking at you and treating you differently – yes, “hot chicks” included. 2. How does it feel to be at the Yoga class surrounded by LOTS of women? What a sweet deal! Just don’t tell my wife I said that. But seriously, it doesn’t really faze me. When I am working out – this includes Yoga – I get in “the zone”. It is pretty hard to distract me at that point. 3. Being a little more serious now…how does your wife Flavia supports you with your career? We complement each other well and this greatly helps both of our businesses. Where I am more of the dreamer and entrepreneur, Flavia helps keep me on task and organized. It is great to be part of a relationship were our individuality allows us to become greater as a whole. 4. Which is your answer to people saying that since you’re working with Ben Pakulski you’re not as big and muscular as you used to? Well, this is the first I have heard of it…but I am not surprised. There is a lot of ignorance out there. People confuse size with muscularity. A guy that is 220 at 20% body-fat will look “bigger” than a guy that is 200 and 10% body-fat, although the second guy has more muscle. I would say that since I started working out with Ben, I am definitely the most muscular I have ever been. 5. What advice can you give to guys looking to get their Pro Card? Get yourself out there. Too often I see guys asking the question, but doing nothing with the answer. Find some local shows to get started and get your foot in the door. You have to set measurable goals – a deadline with an actual number. This turns your dreams into goals. By registering for a competition, you get a set date where you know you have to be a certain size and body-fat percentage. Every competition, you will get better and more confident. From there, it is just the matter of getting into events that have a “Pro” designation. The WBFF is a well-know and recognized institution and the one that I got my Pro Card from. Often it means placing somewhere in the top three of the competition. 6. By the way, what are your Fitness plans for the future? Will you ever get on stage again? My fitness plans are always on my mind. Although I haven’t set my 2013 fitness goals, I definitely plan on competing on stage again. Something that not too many people know is I have bone chips in my elbow. This greatly decreases my ability to fully shorten my biceps muscle. I am in the process of getting it fixed – with any luck, this includes surgery sometime this year. When I get it fixed, game over! 7. What else can you tell us about you that not so many people know? I am an avid reader. My 2013 goal is to read two new books a month. I enjoy books from a WIDE range of topics – fiction, business, fitness training, motivational, mindset, you name it! Most recently, I have been devouring a lot of Seth Godin’s books. Great for anybody really, but especially those with an entrepreneurial spirit. If you are absolutely serious about achieving your physique goal (or any goal for that matter), you need to have a plan. From training to nutrition, are you following a plan to get you from where you currently are to where you want to be? As far as weight training is concerned, you must ensure you progress week to week. This can be in the form of poundage, more sets or reps with the same weight, less rest time, a change in lifting tempo. Your goal is to make the workouts a little tougher week to week. Finally, one of the biggest things that I have learned through training with Ben Pakulski is that form absolutely matters when it comes to building a well balanced physique. This isn’t to say I had bad form before, but even if you change your body position by a degree or two…you can go from not engaging the working muscle to fully blasting and isolating it. Stay focused, stay motivated and you WILL achieve your own body transformation.